Article 1. Everyone is born free and equal. Article 2. 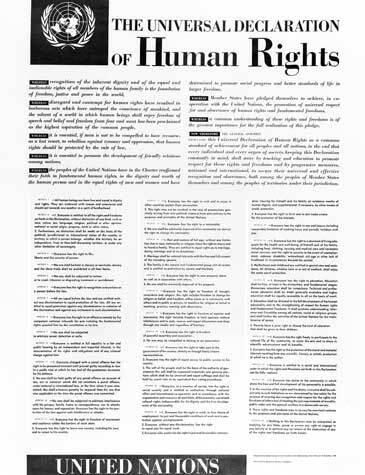 Everyone has all the rights in this document regardless of race, ethnicity, gender or nationality. Article 3. Everyone has the right to live, to be free and to feel safe. Article 4. No one can be put in slavery. Article 5. No one can be tortured, treated with cruelty or made to feel less than human. Article 6. Everyone has the right to be recognized as a person before the law. Article 7. Everyone has the right to be treated and protected equally by the law. Article 8. Everyone has the right to a fair courts and judges in order to see that justice is done. Article 9. No one can be arrested, held in prison or kept out of her/his country without a fair reason. Article 10. Everyone has the right to fair and public hearing before the courts. Article 11. Everyone is innocent until proven guilty. No one can be punished for something that was not illegal before it when it happened. No one can be given a greater punishment than the one that applied when the crime was committed. Article 12. Everyone has the right to privacy. Everyone has the right to protection of her/his honor and reputation. Article 13. Everyone has the right to move freely within the borders of a country. Everyone has the right to leave and return to her/his country. Article 14. Everyone has the right to seek asylum in another country if they are persecuted. Article 15. Everyone has a right to a nationality. Everyone has the right to change her/his nationality. Article 16. Every adult has the right to marry and create a family. Every family has the right to be protected by the law and society. Article 17. Everyone has the right to own property. No one can have their property taken from them. Article 18. Everyone has the right to choose and practice her/his religion. Article 19. Everyone has the right to her/his ideas and opinions. Everyone has the right to express those ideas and opinions. Article 20. Everyone has the right to join any group of people and assemble peacefully. No one may be forced to join a group. Article 21. Everyone has the right to vote and to participate in their government. Article 22. Everyone has the right to have her/his basic needs met and to live in dignity. Governments have a duty to help make this possible. Article 23. Everyone has the right to work, to choose the work s/he does, to be paid fairly and equally, and to join a union. Article 24. Everyone has the right to rest and leisure including holidays with pay. Article 25. Everyone has the right to food, clothes, shelter, medical care and economic security. Mothers and children have the right to special care and assistance. Article 26. Everyone has the right to free and equal education for the primary grades. Higher education must be equally accessible. Education should support people in becoming the best they can be. Education should promote human dignity, understanding and peace. Parents have the right to choose the type of education for their children. Article 27. Everyone has the right to participate in the cultural life of their community and to share in the benefits of scientific advancements. Article 28. Everyone has the right to the kind of world where their rights and freedoms, such as the ones in this declaration, are respected and protected. Article 29. Everyone has the responsibility to help create a community where these rights and freedoms are possible. Article 30. Nothing in this declaration may be interpreted in a way that would weaken or take away the rights of others.